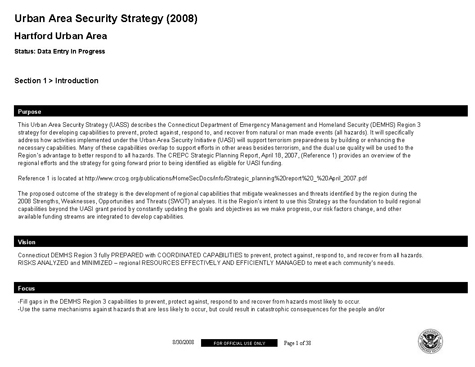 This Urban Area Security Strategy (UASS) describes the Connecticut Department of Emergency Management and Homeland Security (DEMHS) Region 3 strategy for developing capabilities to prevent, protect against, respond to, and recover from natural or man made events (all hazards). It will specifically address how activities implemented under the Urban Area Security Initiative (UASI) will support terrorism preparedness by building or enhancing the necessary capabilities. Many of these capabilities overlap to support efforts in other areas besides terrorism, and the dual use quality will be used to the Region’s advantage to better respond to all hazards. The CREPC Strategic Planning Report, April 18, 2007, (Reference 1) provides an overview of the regional efforts and the strategy for going forward prior to being identified as eligible for UASI funding. The proposed outcome of the strategy is the development of regional capabilities that mitigate weaknesses and threats identified by the region during the 2008 Strengths, Weaknesses, Opportunities and Threats (SWOT) analyses. It is the Region’s intent to use this Strategy as the foundation to build regional capabilities beyond the UASI grant period by constantly updating the goals and objectives as we make progress, our risk factors change, and other available funding streams are integrated to develop capabilities. Goal: GOAL 2: ENHANCE CBRNE / WMD DETECTION AND RESPONSE. Objective Objective 2.1: Develop plans to sustain current capabilities while building additional needed capabilities by June 2009. Step: 2.1.1. Assess current (regional and state) plans (including MMRS deliverables 4 & 5) and capabilities to determine gaps in planning, organization, equipment, training and exercising. Step: 2.1.2. Develop regional Concept of Operations Plans and CBRNE/WMD Strategy. Step: 2.1.3. Identify funding needed to sustain current CBRNE/WMD capabilities. Step: 2.1.4. Develop plan for building capabilities needed to fill existing gaps. Step: 2.1.5. Identify funding needed to sustain new capabilities developed. Goal: GOAL 7: IMPROVE MASS CARE CAPABILITY. Objective 7.1: Develop a regional integrated shelter plan (in collaboration with ongoing State efforts) by December 2009 that provides adequate regional mass care shelter capability and special needs shelter capability via a Universal Access Shelter Network. Step: 7.1.1. Evaluate current shelter capacity (facilities, equipment, supplies, and staff) by June 2009. Step: 7.1.2. Establish target capacity for all shelter needs by December 2009. Step: 7.1.3. Identify locations to establish target shelter capability by June 2010. Step: 7.1.4. Establish equipment (including communications equipment) and supplies requirements to achieve target shelter capabilities by June 2010. Step: 7.1.5. Establish staff requirements to serve target shelter capabilities by June 2010.